Knowledge about the natural history of severe alpha 1-antitrypsin (AAT) deficiency (PiZZ) is limited. Our aim was to compare the survival of PiZZ individuals with randomly selected controls from the Swedish general population. The PiZZ subjects (n=1585) were selected from the Swedish National AATD Register. The controls (n=5999) were randomly selected from the Swedish population register. Smoking habits were known for all subjects. Median follow-up times for the PiZZ subjects (731 never-smokers) and controls (3179 never-smokers) were 12 and 17 years, respectively (p<0.001). During follow-up, 473 PiZZ subjects (30%), and 747 controls (12%) died. The PiZZ subjects had a significantly shorter survival time than the controls, p<0.001. After adjustment for gender, age, smoking habits and presence of respiratory symptoms, the risk of death was still significantly higher for the PiZZ individuals than for the controls, hazard ratio (HR) 3.2 (95% CI 2.8–3.6; p<0.001). By contrast, the risk of death was not increased in never-smoking PiZZ individuals identified by screening, compared to never-smoking controls, HR 1.2 (95% CI 0.6–2.2). The never-smoking PiZZ individuals identified by screening had a similar life expectancy to the never-smokers in the Swedish general population. Early diagnosis of AAT deficiency is of utmost importance. Severe alpha 1-antitrypsin (AAT) deficiency (PiZZ) is an autosomal, co-dominant, hereditary disorder. The AAT deficiency is one of the most prevalent inherited disorders in populations of European descent, and it is characterised by low AAT levels in the serum and lungs . The main function of AAT is to inhibit neutrophil elastase and other serine proteases, including proteinase-3 and plasmin activator. This genetic defect results in the polymerisation of the AAT molecule in the hepatocytes, and the accumulation of the Z protein within the hepatocytes, leading to decreased release into the circulation. The leading manifestation of the disease in PiZZ individuals is chronic obstructive pulmonary disease (COPD) with early onset emphysema, particularly in smokers. 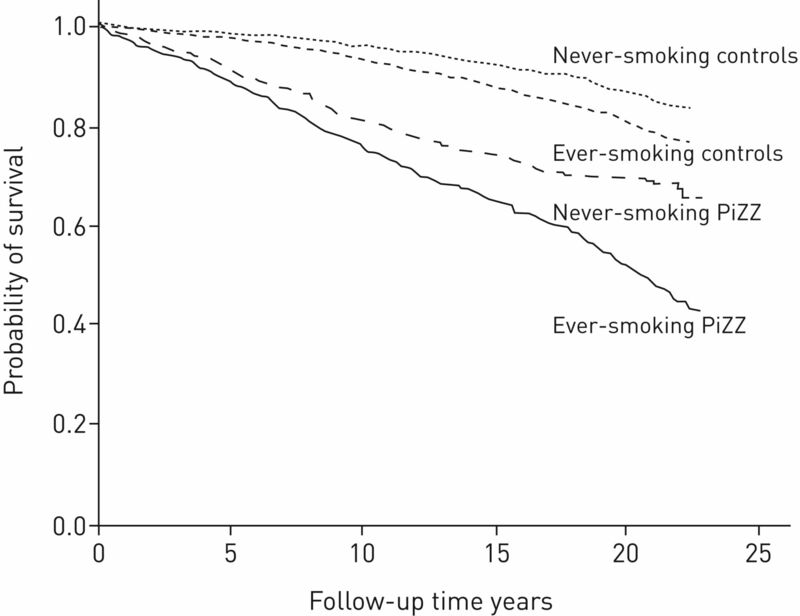 In smokers, COPD develops 10–20 years earlier than in smokers with normal AAT levels . In addition, the never-smoking PiZZ individuals are at risk of developing emphysema . Liver disease is the second most frequent clinical manifestation of severe AAT deficiency, and typically presents as neonatal cholestasis in infancy and cirrhosis and hepatocellular carcinoma in late adulthood . Further associated diseases are bronchial asthma, bronchiectasis, cutaneous panniculitis and systemic vasculitis (antineutrophil cytoplasmic antibodies (ANCA) positive) [4–7]. PiZZ individuals, especially those who smoke, have an increased mortality rate compared to the general population . The predominant causes of death in both ever- and never-smokers with PiZZ are emphysema and liver cirrhosis. A major limitation of previous mortality studies is the comparison of survival among individuals with AAT deficiency with the general population, without information on their smoking habits. As the control group included smokers, which precluded the possibility of adjustment of the analyses for smoking habits, the mortality risk in never-smoking PiZZ individuals might have been underestimated [8–10]. Since 1991, all adult individuals with confirmed severe AAT deficiency (PiZZ) in Sweden have been invited to participate in the Swedish National Register of Severe AAT Deficiency . The register documents comprehensive physiological data, including comorbidities and smoking habits. Participants are prospectively followed-up every 2 years by their attending physician, and the results are reported to the register. The Obstructive Lung disease in Northern Sweden (OLIN) is an epidemiological research programme in progress in northern Sweden since 1985, with a focus on asthma, allergies, COPD and health economics. In total, more than 50 000 individuals aged 7–91 years, who are followed longitudinally, have so far participated in population-based cohorts [12, 13]. The aim of this study was to analyse survival in PiZZ individuals compared to controls from the general population with known smoking habits, with particular reference to PiZZ individuals identified by screening. The second aim was to analyse the most common causes of death among the ever-smoking and never-smoking individuals with severe AAT deficiency. This was an observational study of PiZZ individuals and population-based controls. The PiZZ subjects were identified from the Swedish National AATD Register, which has been previously described in detail . Eligibility criteria for enrolment in the register were age ≥18 years, severe AAT deficiency (PiZZ, PiZNull and PiNull Null) and written informed consent. Clinical examination, blood samples (liver function) and lung function tests were performed at the patient's local hospital. Thereafter, the results were reported to the register via a questionnaire, which was answered by the attending physician every 2 years. More than 95% of the PiZZ individuals in Sweden have agreed to be included in the AAT register. The indications for plasma protein analysis leading to PiZZ diagnosis were the following: respiratory diseases or symptoms, including repeated respiratory tract infections; liver diseases; other diseases and family/population screening. Other diseases included renal diseases, joint symptoms, repeated infections other than respiratory tract infection, high sedimentation rate, or other signs and symptoms for which plasma protein analysis was performed as part of the clinical investigation. The controls were selected from three population-based, adult cohorts within the epidemiological research programme, the OLIN [12, 13]. The control cohorts were randomly selected individuals from the population register for the northern part of Sweden, who were recruited in 1992 (n=4851, aged 20–69 years), in 1996 (n=7420, 20–70 years) and in 2006 (n=6165, 20–69 years), and were invited to participate in postal questionnaire surveys [14, 15]. The response rates were 85%, 85% and 77%, respectively. The questionnaire included questions on smoking habits, respiratory diseases and symptoms. Smoking habits were divided into non-smoking, ex-smoking (quit smoking at least 12 months prior) and current-smoking, and ever-smokers were defined as ex-smokers or current-smokers. Current-smokers also reported the number of cigarettes smoked per day, and were categorised as follows: <5, 5–14 or >14 cigarettes per day. Because the PiZZ subjects were continuously included in the AATD register since 1991, and the OLIN study included three cohorts at different time points, we randomly selected 2000 subjects from each of the OLIN cohorts, achieving a total of 6000 controls. One control was excluded because of an incorrect Swedish personal identification number. Respiratory symptoms and diseases were reported by the physician for PiZZ subjects, and by the controls themselves in the OLIN studies. In the AAT register, the respiratory symptoms included shortness of breath at rest and on exertion, wheezing, dry cough, cough with sputum, and repeated respiratory tract infections. The respiratory diagnoses included physician-diagnosed asthma or the use of asthma medication, and physician-diagnosed chronic bronchitis and emphysema or the use of COPD medication. In the controls selected from the OLIN surveys, the questions covered symptoms such as wheezing, chronic bronchitis (defined as cough and sputum production for at least 3 months in two consecutive years), as well as physician-diagnosed asthma, the use of asthma medication, and physician-diagnosed chronic bronchitis and emphysema. The subjects who reported respiratory symptoms or disease were classified as symptomatic, and the remaining subjects were classified as asymptomatic. Vital status and causes of death were obtained from the National Register of Causes of Death up to January 2015 for the total study population (1595 subjects from the AAT register and 5999 controls from the three OLIN cohorts). The underlying cause of death was coded according to the 9th (before 1996) and the 10th revisions of the World Health Organization International Classification of Diseases. The register was approved by the Ethical Review Board, Lund, Sweden, and by the Swedish Data Inspection Board. The surveys taken from the OLIN studies were approved by the Ethical Review Board at Umeå University. Baseline data were tabulated using frequencies and percentages for categorical variables, and means with standard deviation for normally distributed, continuous variables. Comparisons of continuous variables with normal distribution were analysed using ANOVA. All participants were followed prospectively from the date of inclusion in the AAT-register or OLIN studies (baseline) to the first of the following occurrences: lung transplantation, death, or January 1, 2015. Cumulative crude survival probabilities were estimated using the Kaplan–Meier method. Differences in crude survival between PiZZ individuals and controls were calculated using the log rank test. The 5-, 10-, 15- and 20-year survival rates were calculated using life tables. The adjusted, relative mortality was analysed using Cox proportional hazards regression, and expressed as hazard ratios with 95% confidence intervals. Covariates in the adjusted model were baseline age, gender, smoking habits, date of inclusion and the presence of respiratory symptoms or respiratory disease. Adjusted mortality was analysed for all PiZZ individuals, and PiZZ individuals identified by screening, respectively. Statistical significance was defined as a two-sided p<0.05. Statistical analyses were performed using the Statistical Package for the Social Sciences (SPSS), version 22.0 (IMB Corp, Armonk, NY, USA). Until January 2015, 1595 PiZZ subjects were included in the AAT deficiency register. In total, 103 subjects had undergone lung transplantation, of whom 10 received the transplant before inclusion in the register, and were thus excluded from this study. The initial reasons for AAT analysis included respiratory diseases or symptoms in 43% (n=678), other diseases or symptoms in 26% (n=420), family/population screening in 24% (n=375) and liver disease in 7% (n=112). From the population-based OLIN cohorts, 5999 controls were included. The demographic baseline data of the study population are shown in table 1. Median (range) follow-up times for the PiZZ subjects and controls were 12 (0.1–23) and 17 (0.2–23) years, respectively (p<0.001). The PiZZ subjects were older than the controls and had a greater number of respiratory symptoms. 54% of the PiZZ subjects and 47% of the controls were ever-smokers, p<0.001. At inclusion, 130 (8%) of the PiZZ individuals and 1555 (26%) of the controls were current-smokers, p<0.001. Respiratory diseases and symptoms were reported in 980 PiZZ subjects (62%) and 1858 controls (31%) at inclusion. Among the PiZZ subjects with respiratory disease and symptoms, 489 (50%) had a diagnosis of emphysema with or without chronic bronchitis, 217 (22%) had chronic bronchitis without emphysema, 178 (18%) had asthma, 32 (4%) had bronchiectasis, 13 (1%) had lung fibrosis and 51 subjects (5%) had other respiratory symptoms. Among the controls who reported having respiratory symptoms or diseases, 222 (12%) had a diagnosis of emphysema with or without chronic bronchitis, 786 (42%) had asthma, and 850 (46%) had respiratory symptoms (wheezing, cough with or without sputum production). Of the 375 PiZZ individuals identified by screening, 179 (48%) were men, 219 (58%) were never-smokers and 107 (29%) had respiratory symptoms or disease at inclusion. 44 subjects (12%) died during the follow-up time, 11 of whom were never-smokers. During the follow-up time, 473 PiZZ subjects (30%), and 747 controls (12%) died. The PiZZ subjects had a significantly shorter survival time than the controls (log rank test, p<0.001, figure 1). There were 746 (20%) deaths among the 3674 ever-smokers (301 deaths among the PiZZ group and 445 among the controls) and 474 (12%) deaths among the 3910 never-smokers (172 deaths among the PiZZ group and 302 among the controls). Kaplan–Meier curve illustrating survival in 1585 PiZZ subjects and 5999 population-based controls. 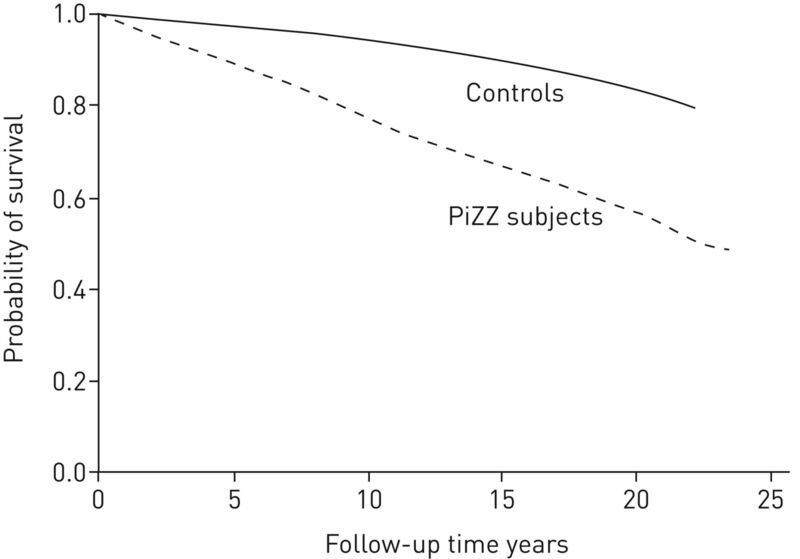 Kaplan–Meier curves illustrating survival in PiZZ subjects and controls, stratified by smoking habits. The 5-, 10-, 15- and 20-year survival rates of ever- and never-smoking PiZZ individuals were lower than those of ever- and never-smoking controls (table 2). After adjustment for gender, age, smoking habits, date of inclusion and presence of respiratory symptoms at inclusion in the multivariate Cox regression model, the risk of death was significantly higher for the PiZZ individuals than for the controls, HR 3.2 (95% CI 2.8–3.6), p<0.001. To examine the interaction between smoking habits, gender, and the presence of symptoms, the multivariate Cox regression model was used for subgroups of PiZZ individuals and controls (table 3). Never-smoking PiZZ individuals identified by screening had no increased risk of death when compared to never-smoking controls. The main causes of death in PiZZ individuals were respiratory diseases, n=245 (52%); cardiovascular disease (CVD), n=74 (16%); hepatic disease, n=72 (15%); and cancer, n=51 (11%). Among the controls, the main causes of death were CVD (38%) and cancer (33%). The causes of death for ever- and never-smoking PiZZ subjects and controls are shown in table 4. The main finding in our study was the similarity in life expectancy observed between never-smoking PiZZ individuals, identified by screening and never-smokers in the Swedish general population. The never-smoking PiZZ subjects identified by screening are, owing to the mode of identification, likely to be representative of never-smoking PiZZ subjects in the population. Therefore, we might assume that our results are applicable to all PiZZ never-smokers in Sweden, even those who remain unidentified. Thus, our results show that the PiZZ phenotype, per se, does not influence life expectancy. Therefore, the most important task for PiZZ individuals is to avoid smoking, i.e. never start smoking; thus, early diagnosis of AAT deficiency is of great importance. Screening, before the potential age of smoking debut, is thus a feasible aim. Moreover, all PiZZ individuals who still smoke at the time of a correct diagnosis of AAT deficiency should be advised and offered appropriate help to stop smoking immediately. Our series of reports on the prospective follow-up of the cohort of PiZZ individuals identified by neonatal screening have shown that smoking is less common among these AAT-deficient subjects than among their peers identified among the Swedish population register [2, 16, 17]. These results indicate that early identification and continuous anti-smoking information is effective. Our results might explain why many PiZZ subjects remain unidentified, despite a high prevalence of the deficiency in Sweden. It is possible that the majority of the unidentified PiZZ subjects are never-smokers, and asymptomatic, and therefore do not need to seek medical care. Our results indicate that these subjects might remain asymptomatic throughout their lifetime, without developing liver or lung disease. One possible explanation for the similar survival between never-smoking PiZZ individuals identified by screening and the controls in our study might be the lifestyle changes that were made after having been made aware of the condition. The AAT-deficient individuals might have been more conscious of the deficiency, giving them the opportunity to avoid risk factors other than smoking, such as general exposure to airway irritants, e.g. passive smoking, and occupational exposure to airway irritants. Another possible explanation might be the reduced risk in PiZZ individuals, of developing some diseases, such as ischaemic heart disease and hypertension. Our recently published study has shown that PiZZ individuals have lower mortality due to ischaemic heart disease than the general population . Dahl et al. have also reported that PiZZ individuals might have lower blood pressure than healthy controls. As expected, we found that the most common cause of death in both ever-smoking and never-smoking PiZZ individuals was respiratory diseases (52%). In accordance with our previously published study , hepatic diseases were one of the most common causes of death; liver cirrhosis accounted for 9% and hepatocellular carcinoma for 5% of the causes of death. These results show the importance of regular monitoring of PiZZ individuals regarding liver diseases, e.g. by ultrasound or other imaging modalities. We also found that death due to cancer in general was lower in the PiZZ decedents compared to the controls, 11% versus 33%. Pulmonary carcinoma accounted for 1% of the causes of death in PiZZ decedents and 4% in the controls. A previously published study has indicated that AAT deficiency carriers have an increased risk of lung cancer . We could not confirm these results, when smoking habits for controls were taken into account in the present analysis. The natural history of severe AAT deficiency has been poorly documented previously, and mortality studies are sparse [8–10, 21]. The earliest available analysis, published in 1978 by Larsson , noted that survival was significantly reduced in PiZZ individuals compared to the general Swedish population with unknown smoking habits. One limitation with previously published mortality studies on PiZZ subjects has been the inclusion of mostly smokers and patients identified because of respiratory symptoms or diseases; thus, never-smokers and asymptomatic subjects are underrepresented. Another limitation has been the comparison of survival in PiZZ individuals with that of samples from the general population, without correction for smoking habits. However, in our published study that included a large number of never-smoking and asymptomatic PiZZ individuals, we found that PiZZ subjects had a longer survival than previously reported . To our knowledge, this is the first study that allowed comparison of mortality and causes of death between PiZZ individuals and a random sample of subjects from the general population with known smoking habits. The OLIN studies are a large, unique epidemiological research programme that began in 1985 and includes several randomly selected population-based cohorts. The postal questionnaire surveys sent out at the time of recruitment of the cohorts included questions on smoking habits; thus, the OLIN studies give a unique opportunity to evaluate health status in the general population, taking smoking habits into account. The second important strength in our study is the collection of all data from a well-established national register of PiZZ individuals with a valid diagnosis verified by isoelectric focusing. In Sweden, the detection rate of severe AAT deficiency is relatively high (30%). The majority of individuals in the AAT register were identified by investigation for reasons other than respiratory conditions, and 24% have been identified by family or population screening. Another important strength in our study is the cross linkage of data using Swedish personal identification numbers, which facilitated the assessment of mortality in all PiZZ individuals and controls with complete follow-up. One limitation of our study: the controls were not recruited specifically for the present study, but were taken from a separate study of random population samples in the northern part of Sweden; whereas the PiZZ subjects in the AAT deficiency register were recruited from all parts of Sweden. Secondly, the PiZZ subjects included in the AAT deficiency register are not a random sample of PiZZ subjects in Sweden, even if a relatively high proportion of these individuals (24%), have been identified by screening. For this reason, we compared separately the survival of PiZZ subjects identified by screening with the controls. Respiratory symptoms and diagnoses were self-reported in the controls, and physician-reported in the AAT-deficient individuals. This fact might explain the relatively high prevalence of asthma, chronic bronchitis and emphysema in the controls. Furthermore, subjects with respiratory symptoms might answer a survey more readily than healthy, asymptomatic individuals, leading to potential recall bias regarding self-reported data. The participation rates in the OLIN studies were also lower than those in the AAT register. Another limitation was posed by the younger controls at inclusion, who were followed-up for a longer duration than the PiZZ subjects were. However, the difference in survival was still significant when statistical adjustments were made for age and date of inclusion. We conclude that the never-smoking PiZZ individuals identified by screening have a similar life expectancy as the never-smokers in the Swedish general population. Thus, early identification of PiZZ and smoking prevention among these subjects is of utmost importance. We would like to acknowledge the help received with collection of data by the OLIN staff. We thank all the Swedish physicians who reported data to the Swedish AAT deficiency register. Author Contributions: Conception, design, analysis and interpretation of data: H.A. Tanash; drafting of the article: H.A. Tanash, E. Piitulainen; revision for important intellectual content and approval of the version to be published: H.A. Tanash, E. Piitulainen, M. Ekström, E. Rönmark, A. Lindberg. Support statement: H.A. Tanash was supported by unrestricted grants from the Swedish Heart-Lung Foundation. M. Ekström was supported by unrestricted grants from the Swedish Society of Medicine and the Swedish Heart-Lung Foundation. E. Piitulainen was supported by unrestricted grants from the Swedish Heart-Lung Foundation.
. American Thoracic Society/European Respiratory Society statement: standards for the diagnosis and management of individuals with alpha-1 antitrypsin deficiency. Am J Respir Crit Care Med 2003; 168: 818–900.
. Health status and lung function in the Swedish alpha 1-antitrypsin deficient cohort, identified by neonatal screening, at the age of 37-40 years. Int J Chron Obstruct Pulmon Dis 2017; 12: 495–500. , et al. Clinical course and prognosis of never-smokers with severe alpha-1-antitrypsin deficiency (PiZZ). Thorax 2008; 63: 1091–1095. , et al. Asthma and allergy in alpha-1 antitrypsin deficiency. Respir Med 2006; 100: 1384–1391. , et al. Prevalence and impact of bronchiectasis in alpha1-antitrypsin deficiency. Am J Respir Crit Care Med 2007; 176: 1215–1221.
. Alpha 1-antitrypsin deficiency-associated panniculitis: case report and review of the literature. Pediatr Dermatol 1991; 8: 296–299. , et al. The PiZ gene of alpha 1-antitrypsin as a determinant of outcome in PR3-ANCA-positive vasculitis. Kidney Int 1995; 48: 844–850. , et al. Survival in severe alpha 1-antitrypsin deficiency (PiZZ). Respir Res 2010; 11: 44.
, et al. Mortality in individuals with severe deficiency of alpha1-antitrypsin: findings from the National Heart, Lung, and Blood Institute Registry. Chest 2005; 127: 1196–1204. , et al. Incidence of physician-diagnosed asthma in adults–a real incidence or a result of increased awareness? Report from The Obstructive Lung Disease in Northern Sweden Studies. Respir Med 2001; 95: 685–692. , et al. High incidence and persistence of airborne allergen sensitization up to age 19 years. Allergy 2017; 72: 723–730. , et al. Symptoms related to obstructive sleep apnoea are common in subjects with asthma, chronic bronchitis and rhinitis in a general population. Respir Med 2001; 95: 423–429. , et al. Prevalence trends in respiratory symptoms and asthma in relation to smoking–two cross-sectional cohort studies ten years apart among adults in northern Sweden. World Allergy Organ J 2014; 7: 1.
, et al. The Swedish α1-Antitrypsin Screening Study: health status and lung and liver function at age 34. Ann Am Thorac Soc 2015; 12: 807–812. , et al. Cause-specific mortality in individuals with severe alpha 1-antitrypsin deficiency in comparison with the general population in Sweden. Int J Chron Obstruct Pulmon Dis 2016; 11: 1663–1669.
. Risk of ischemic heart and ischemic cerebrovascular disease is not increased in S, Z, and 11478A alpha1-antitrypsin carriers of the Copenhagen City Heart Study. Arterioscler Thromb Vasc Biol 2003; 23: e55–e56. , et al. Alpha1-antitrypsin and neutrophil elastase imbalance and lung cancer risk. Chest 2005; 128: 445–452.
. Natural history and life expectancy in severe alpha-1-antitrypsin deficiency, Pi Z. Acta Med Scand 1978; 204: 345–351.